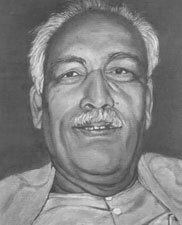 Acharya Hazari Prasad Dwivedi was a great Hindi novelist, legendary essayist, famous literary historian, researcher, excellent writer. Acharya Hazari Prasad Dwivedi was born at 19th August 1907 and died at 19th May 1979. He was born in the traditional family of the village Dubey Chhapra in the Ballia district of the Uttar Pradesh. His childhood name was Baijnath dwivedi. Pandit Anamol Dwivedi was his father who was a Sanskrit Scholar and his mother was Jyotishmiti. For his contribution to Hindi literature he has awarded the Padma Bhushan in 1957 and for his collection of essays, 'Alok Parva he got Sahitya Akademi Award in 1973.